Messier 34 (M34) is a bright, large open cluster located in the northern constellation Perseus. The cluster lies at an approximate distance of 1,500 light years from Earth and has an apparent magnitude of 5.5. It has the designation NGC 1039 in the New General Catalogue. Messier 34 is pretty easy to find in the sky and its stars can be resolved even in 10×50 binoculars. 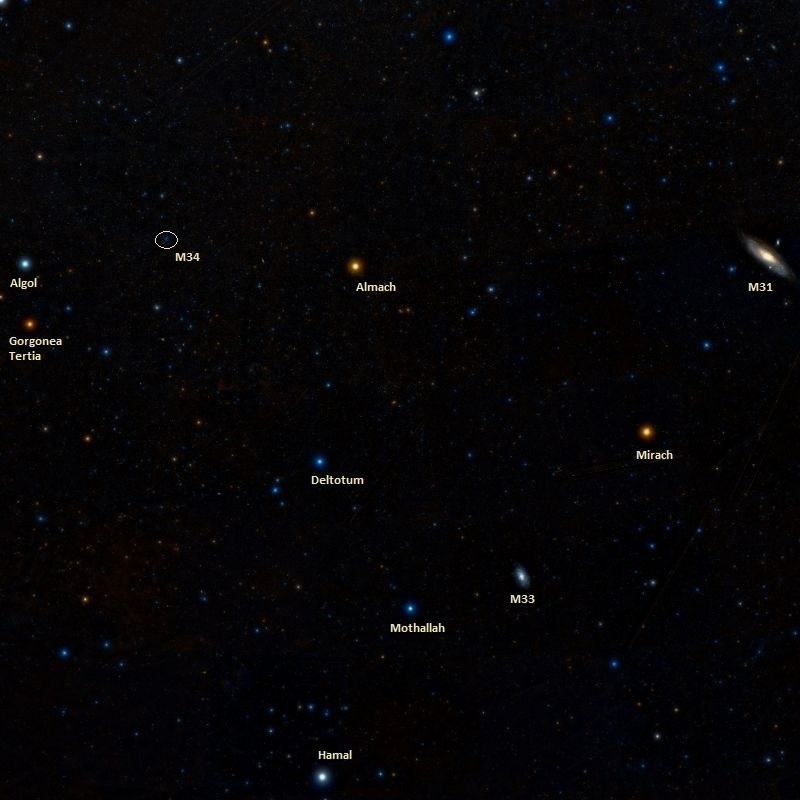 The cluster is located just to the north of the imaginary line drawn from Algol (Beta Persei), the second brightest star in Perseus, to Almach (Gamma Andromedae), the third brightest star in the neighbouring constellation Andromeda. 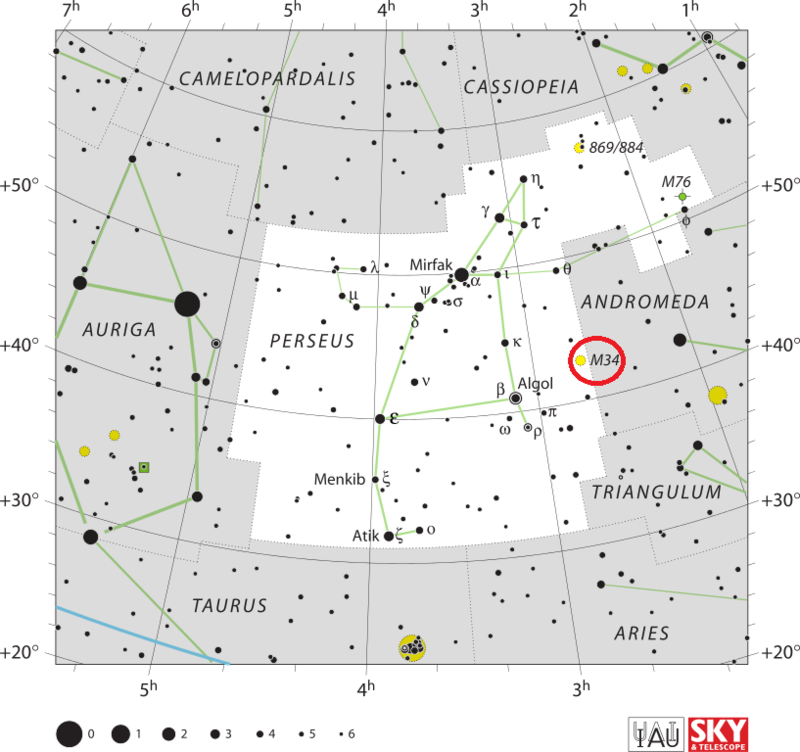 The cluster lies 5 degrees northwest of Algol, a famous eclipsing binary star also known as the Demon Star, that represents the head of the Gorgon Medusa, held by Perseus after his victory over the snake-haired monster. The best way to view M34 is in telescopes at low magnifications. Small telescopes will reveal up to 20 stars, while larger amateur telescopes show about 80 members, many of them arranged in pairs. 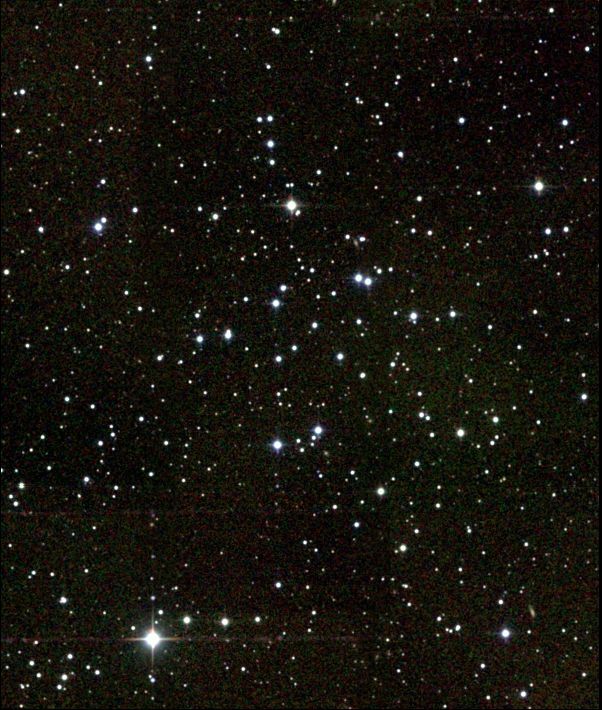 The best time of year to observe the cluster from northern latitudes is in the months of October, November and December. Messier 34 is one of the nearest Messier objects to Earth. There are only six other deep sky objects listed in Messier’s catalogue that are closer to us: Pleiades (M45), the Beehive Cluster (M44), the Ptolemy Cluster (M7), the open cluster Messier 39, the Dumbbell Nebula (M27), and the Orion Nebula (M42). 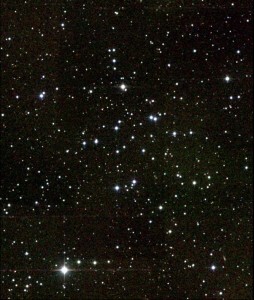 The open cluster is visible to the naked eye in good conditions. It contains about 100 stars, and possibly up to 400 stars with a mass between 0.12 and 1.0 solar masses. M34 occupies an area of 35 arc minutes of the apparent sky, just over the size of a full Moon. It has a true diameter of 14 light years. Messier 34. Atlas Image mosaic obtained as part of the Two Micron All Sky Survey (2MASS), a joint project of the University of Massachusetts and the Infrared Processing and Analysis Center/California Institute of Technology, funded by the National Aeronautics and Space Administration and the National Science Foundation. Messier 34 is a relatively young star cluster, with an estimated age of between 200 and 250 million years. The brightest star in M34 has a visual magnitude of 7.9. At least 19 stars in M34 are white dwarfs, stellar remnants with a mass about the same as the Sun and a size comparable to that of the Earth. Messier 34 is classified as Trumpler type I 3 m, which means that it is detached from the surrounding field and has a strong central concentration (I), it contains both bright and faint stars (3), and is medium rich, with 50 to 100 stars. In 1983, scientists discovered that the spatial motion of M34 coincided with that of the Pleiades cluster (Messier 45) in Taurus, the open cluster NGC 2516 and the Southern Pleiades (Theta Carinae Cluster, IC 2602) in Carina, the Delta Lyrae Cluster (Stephenson I) in Lyra, and the Alpha Persei Cluster in Perseus. 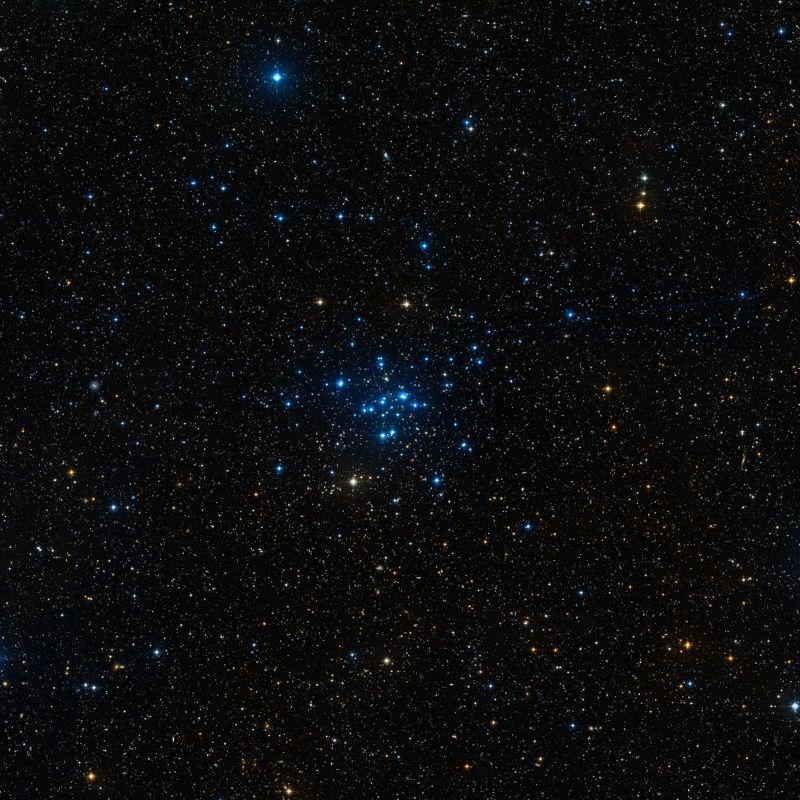 American astronomer Olin J. Eggen, who made the discovery, called this group of open clusters the Local Association. The stars in these clusters share a common age and place of origin. Messier 34 is one of only two deep sky objects located in Perseus constellation that were catalogued by Messier. The other one is Messier 76, the Little Dumbbell Nebula, one of the four planetary nebulae included in Messier’s catalogue. In the same night of [August] 25 to 26, I have determined the position of a cluster of small stars between the head of the Medusa [Algol] & the left foot of Andromeda almost on the parallel of the star Gamma of that letter constellation. With an ordinary [non-achromatic] refractor of 3 feet [FL], one distinguishes these stars; the cluster may have 15 minutes in extension. I have determined its position with regard to the star Beta in the head of the Medusa; its right ascension has been concluded at 36d 51′ 37″, & its declination as 41d 39′ 32″ north. A double star in a cluster, between the right foot of Andromeda and the head of Medusa; where a line from Polaris between Epsilon Cassiopeiae and Alpha Persei to within 2deg of the parallel of Algol, will meet it. A and B, 8th magnitudes, and both white. It is in a scattered but elegant group of stars from the 8th to the 13th degree of brightness, on a dark ground, and several of them form into coarse pairs. This was first seen and registered by Messier, in 1764, as a “mass of small stars;” and in 1783 was resolved by Sir W. Herschel with a seven-foot reflector: with the 20-foot he made it “a coarse cluster of large stars of different sizes.” By the method he applied to fathom the galaxy, he concluded the profundity of this object not to exceed the 144th order.